Congress proclaimed March as Irish-American Heritage Month in 1991, and the President issues a proclamation commemorating the occasion each year. Originally, a religious holiday to honor St. Patrick, who introduced Christianity to Ireland in the fifth century, St. Patrick’s Day has evolved into a celebration for all things Irish. The world’s first St. Patrick’s Day parade occurred on March 17, 1762, in New York City, featuring Irish soldiers serving in the English military. This parade became an annual event, with President Truman attending in 1948. 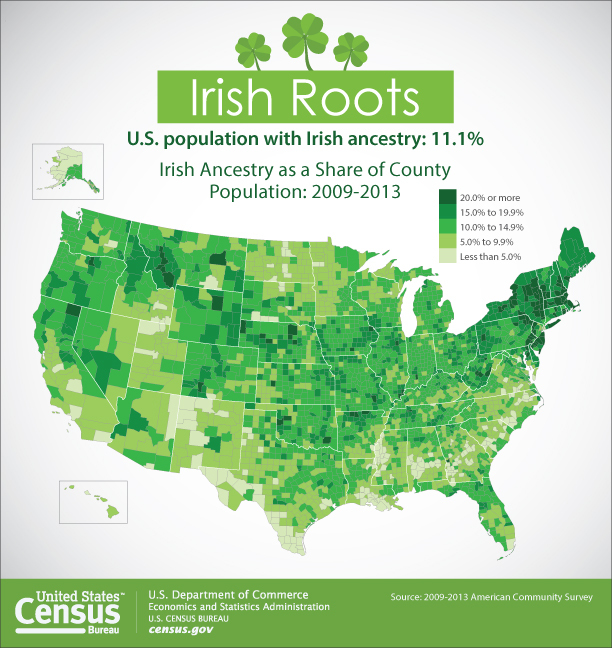 Following are a few key statistics from the U.S. Census Bureau in recognition of St. Patrick's Day. Number of U.S. residents who claimed Irish ancestry in 2013. This number was more than seven times the population of Ireland itself (4.6 million). Irish was the nation’s second-most frequently reported European ancestry, trailing German. Percentage of the population in Massachusetts that claimed Irish ancestry, which is among the highest in the nation. California has 2.5 million people claiming Irish ancestry, which is the highest of any state. Percentage of people of Irish ancestry, 25 or older, who had a bachelor’s degree or higher. In addition, 93.6 percent of Irish-Americans in this age group had at least a high school diploma. For the nation as a whole, the corresponding rates were 29.6 percent and 86.6 percent, respectively. Median income for households headed by an Irish-American, higher than the median household income of $52,250 for all households. In addition, 7.3 percent of family households of Irish ancestry were in poverty, lower than the rate of 11.6 percent for all Americans. National Women’s History Month’s roots go back to March 8, 1857, when women from New York City factories staged a protest over working conditions. International Women’s Day was first observed in 1909, but it wasn’t until 1981 that Congress established National Women’s History Week to be commemorated the second week of March. In 1987, Congress expanded the week to a month. Every year since, Congress has passed a resolution for Women’s History Month, and the President has issued a proclamation. Following are a few key statistics on women in the United States and the role they play in our labor force and economy. The number of females in the U.S. as of December 2013. The number of males was 156.1 million. The number of females 16 and older who participated in the civilian labor force in 2013. Women comprised 47.4 percent of the civilian labor force in 2013. Percentage of social scientists who were women, the heaviest representation of women among all STEM (science, technology, engineering and math) fields. Among other STEM fields, approximately 14 percent of engineers, 45 percent of mathematicians and statisticians and 47 percent of life scientists were women. The median annual earnings of women 15 or older who worked year-round, full time in 2013. In comparison, the median annual earnings of men were $50,033. Number of women veterans in the United States in 2013. For more interesting statistics on women in the United States, please go to the latest issue of the U.S. Census Bureau's Facts for Features. Super Bowl XLIX will be played Feb. 1 at University of Phoenix Stadium in Glendale, Ariz. This will be the second time the NFL’s championship game will be held in Glendale and the third time in the Phoenix metropolitan area. 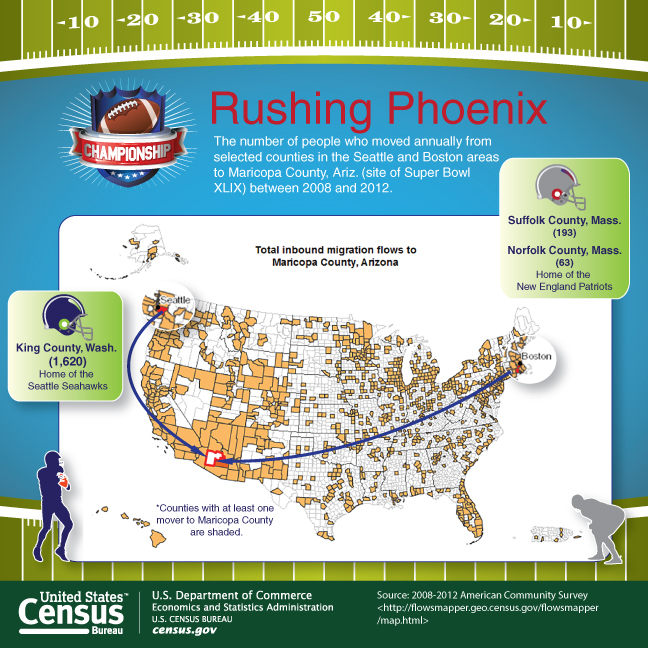 To commemorate this event, the U.S. Census Bureau has compiled a collection of facts examining the demographics of the host metropolitan area, as well as the metro areas represented by the two participants — the New England Patriots and the Seattle Seahawks. Where Boston ranked on the list of the nation’s most populous metropolitan areas. The estimated population of the Boston-Cambridge-Newton, Mass.-N.H., metro area on July 1, 2013, was 4,684,299. The Boston metro area gained 42,204 people from July 1, 2012, to July 1, 2013. At the time of the Patriots’ first season in 1960, the 1960 Census population for the city of Boston was 697,197. Where Seattle ranked on the list of the nation’s most populous metropolitan areas. The estimated population of the Seattle-Tacoma-Bellevue, Wash., metro area on July 1, 2013, was 3,610,105. The Seattle area gained 57,514 people from July 1, 2012, to July 1, 2013. At the time of the Seahawks’ first season in 1976, the 1970 Census population for the city of Seattle was 530,831. Where Phoenix ranked on the list of the nation’s most populous metropolitan areas. 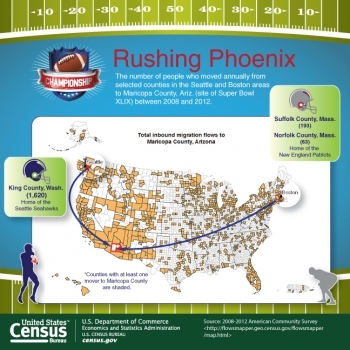 The estimated population of the Phoenix-Mesa-Scottsdale, Ariz., metro area on July 1, 2013, was 4,398,762. The Phoenix area gained 71,130 people from July 1, 2012, to July 1, 2013. For more information, please go to the Census Bureau's Facts for Features or go to <http://quickfacts.census.gov> for more statistics about the cities involved. This festive season, or simply the holidays, is a time for gathering and celebrating with family and friends, gift giving, reflection and thanks. 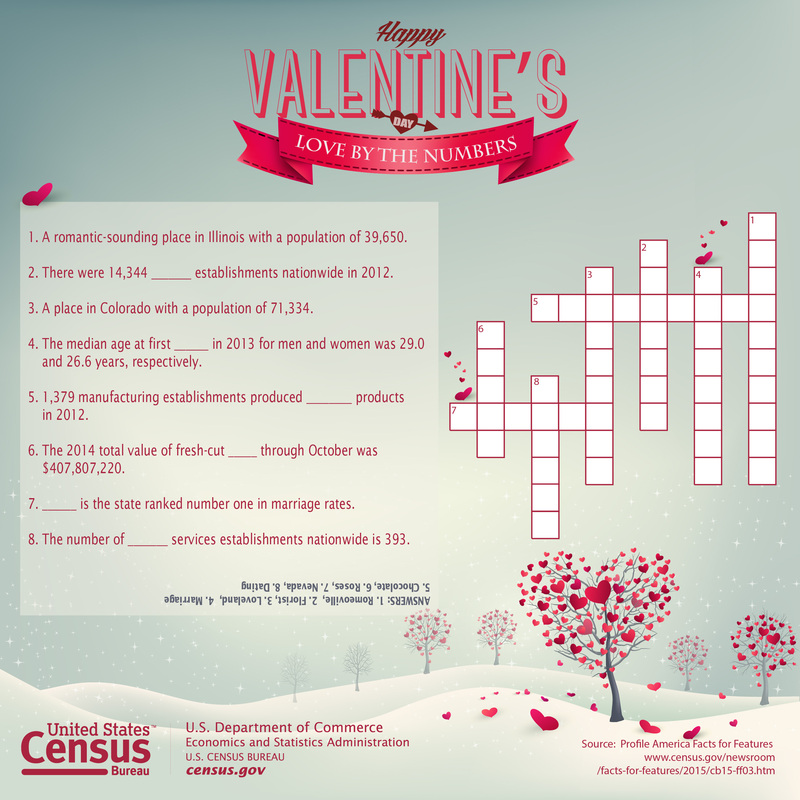 To commemorate this time of year, the U.S. Census Bureau presents the following holiday-related facts and figures from its collection of statistics. Estimated retail sales by the nation’s department stores (including leased departments) in December 2013. This represents an estimated 40.9 percent jump from the previous month when retail sales were estimated at 17.3 billion. No other month-to-month increase in department store sales last year was as large. The estimated percentage of total 2013 sales for department stores (including leased departments) in December. For jewelry stores, the estimated percentage was 19.1 percent. Estimated value of retail sales by electronic shopping and mail-order houses in December 2013 — the highest total for any month last year. The value of U.S. imports of Christmas tree ornaments from China between January and September 2014. China was the leading country of origin for such items. Similarly, China was the leading foreign source of artificial Christmas trees shipped to the United States ($137.5 million worth) during the same period. The number of locations that primarily produced dolls, toys, and games in 2012; they employed 7,481 workers in the pay period including March 12. California led the nation with 95 establishments. 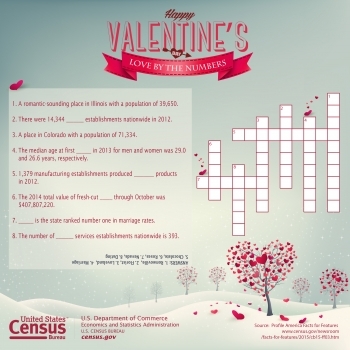 For more information and other key statistics on the holidays, please go to the latest issue of the Census Bureau's Facts for Features. 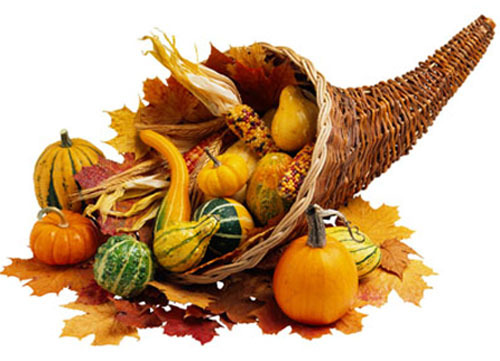 In the fall of 1621, the Pilgrims — early settlers of Plymouth Colony, held a three-day feast to celebrate a bountiful harvest. This event is regarded by many as the nation’s first Thanksgiving. The Wampanoag Indians in attendance played a key role. Historians have recorded ceremonies of thanks among other groups of European settlers in North America. These include the British colonists in Virginia as early as 1619. The legacy of thanks and the feast have survived the centuries, as the event became a national holiday 151 years ago (Oct. 3, 1863) when President Abraham Lincoln proclaimed the last Thursday of November as a national day of thanksgiving. Later, President Franklin Roosevelt clarified that Thanksgiving should always be celebrated on the fourth Thursday of the month to encourage earlier holiday shopping, never on the occasional fifth Thursday. 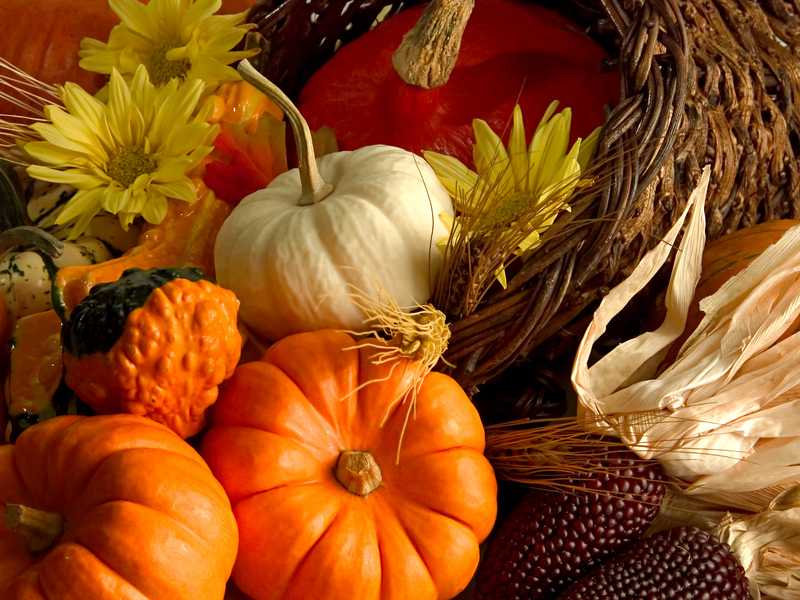 The U.S. Census Bureau today released key statistics in honor of Thanksgiving and the holiday season. There were 242 million turkeys forecasted to be raised in the United States in 2014. Minnesota was the leading state in the number of turkeys raised with 45 million in 2014 followed by North Carolina (35 million), Arkansas (29 million), Indiana (17 million), Missouri (17 million), and Virginia (16 million). 856 million pounds of cranberries were produced in the U.S. in 2014. Wisconsin was estimated to lead all states in the production of cranberries, with 538 million pounds, followed by Massachusetts (estimated at 210 million). New Jersey, Oregon and Washington were also estimated to have substantial production, ranging from 16 to 55 million pounds. 2.4 billion pounds of sweet potatoes — another popular Thanksgiving side dish — were produced in the U.S. in 2014. For more information and other key statistics on Thanksgiving, please go to the latest issue of the Census Bureau's Facts for Features. In recognition of American Indian and Alaska Native Heritage Month, the U.S. Census Bureau today released key statistics for American Indians and Alaska Natives, as this is one of the six major Office of Management and Budget race categories. The first American Indian Day was celebrated in May 1916 in New York. Red Fox James, a Blackfeet Indian, rode horseback from state to state, getting endorsements from 24 state governments, to have a day to honor American Indians. In 1990, President George H.W. Bush signed a joint congressional resolution designating November 1990 as “National American Indian Heritage Month.” Similar proclamations have been issued every year since 1994. The nation’s population of American Indians and Alaska Natives today is 5.2 million, including those of more than one race. They made up about 2 percent of the total population in 2013. Of this total, about 49 percent were American Indian and Alaska Native only, and about 51 percent were American Indian and Alaska Native in combination with one or more other races. The number of states with more than 100,000 American Indian and Alaska Native residents, alone or in combination, in 2013 include California, Oklahoma, Arizona, Texas, New Mexico, Washington, New York, North Carolina, Florida, Alaska, Michigan, Oregon, Colorado and Minnesota. In regards to education, 82.2% of American Indians and Alaska Natives 25 and older who had at least a high school diploma, GED certificate or alternative credential. In addition, 17.6 percent obtained a bachelor’s degree or higher. 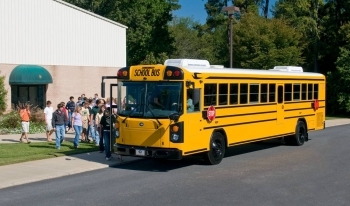 In comparison, 86.3 percent of the overall population had a high school diploma or higher and 29.1 percent had a bachelor’s degree or higher. Median age for those who were American Indian and Alaska Native, alone or in combination, in 2013 was 30.8 years old. This compares with a median age of 37.5 for the U.S. population as a whole. 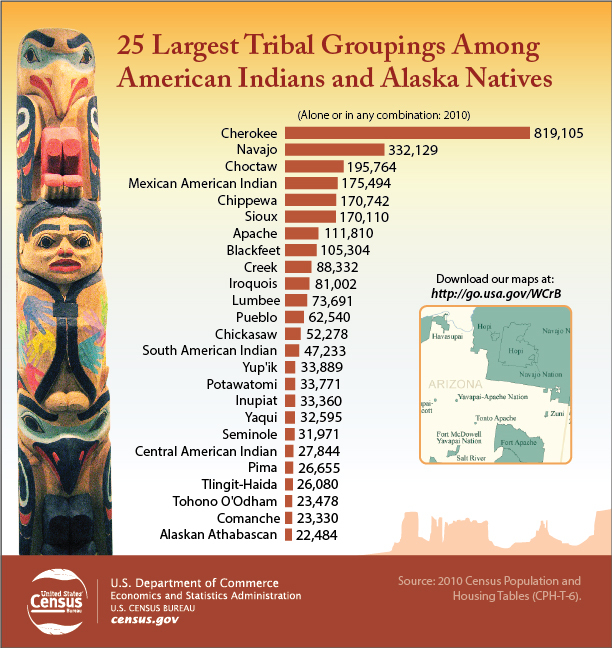 For more information and other key statistics on the American Indian and Alaska Native population, please go to the latest issue of the Census Bureau's Facts for Features. 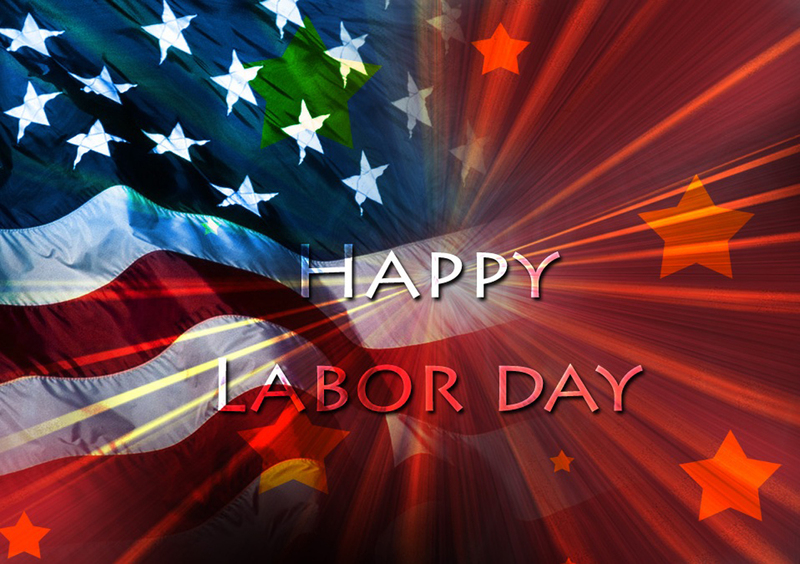 The first observance of Labor Day was likely on Sept. 5, 1882, when some 10,000 workers assembled in New York City for a parade. That celebration inspired similar events across the country, and by 1894 more than half the states were observing a "working men's holiday" on one day or another. Later that year, with Congress passing legislation and President Grover Cleveland signing the bill on June 29, the first Monday in September was designated "Labor Day." This national holiday is a creation of the labor movement in the late 19th century and pays tribute to the social and economic achievements of American workers. Number of people 16 and over in the nation's labor force in May 2013. In preparation for the anniversary of the Americans with Disabilities Act (ADA) on July 26, the U.S. Census Bureau released its collection of the most recent data pertaining to Americans with disabilities. The numbers are striking. People with disabilities represented 19 percent of the U.S. civilian noninstitutionalized population. Persons with a disability have a physical or mental impairment that affects one or more major life activities, such as walking, bathing, dressing, eating, preparing meals, going outside the home, or doing housework. A disability can occur at birth or at any point in a person’s life. Approximately 57 million Americans have a disability. There are more people with disabilities living in America than the entire population of Canada or the Caribbean. More Americans with disabilities require the assistance of others to perform basic activities of daily living than the entire population of Greece. If you take the population of Ireland and cut it in half, that’s roughly the number of Americans living with Alzheimer’s or other neurocognitive disorders. The number of Americans with vision impairments is comparable to the entire population of Switzerland, and there are more Americans with hearing impairments than in all of Denmark, Paraguay or Hong Kong. 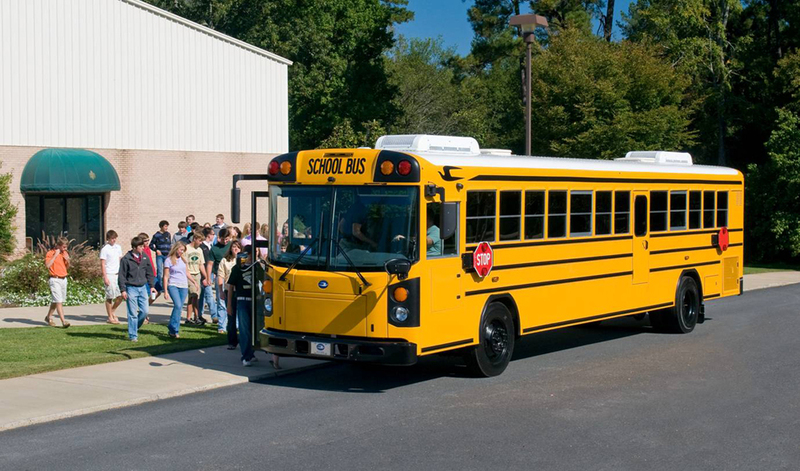 By age in the U.S., 8 percent of children under 15 had a disability; 21 percent of people 15 and older had a disability; 17 percent of people 21 to 64 had a disability; and 50 percent of adults 65 and older had a disability. West Virginia had the highest rate at 19% of the U.S. civilian noninstitutionalized population with a disability, the highest rate of any state in the nation. Utah, at 9 percent, had the lowest rate. On July 26, 1990, President George H.W. Bush signed the Americans with Disabilities Act, which prohibits discrimination against people with disabilities in employment, transportation, public accommodations, commercial facilities, telecommunications, and state and local government services. As we celebrate this Independence Day, we reflect on how America's Founders enshrined the importance of statistics in our Constitution as a vital tool for measuring our people, places and economy. Since 1790, the U.S. Census has been much more than a simple head count; it has charted the growth and composition of our nation. The questions have evolved over time to address our changing needs. Today, the 10-year census, the economic census and the American Community Survey give Congress and community leaders the information they need to make informed decisions that shape our democracy. These statistics are how we know how our country is doing. On this day in 1776, the Continental Congress approved the Declaration of Independence, setting the 13 colonies on the road to freedom as a sovereign nation. As always, this most American of holidays will be marked with red, white and blue flags, fireworks, parades and backyard barbecues across the country. 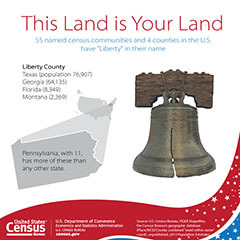 For fascinating figures on the Fourth’s fireworks, flags, cookouts, historical facts on the Declaration of Independence and more, see the Census Bureau’s Facts for Features. The holiday season is a time for gathering to celebrate with friends and family, to reflect and to give thanks. 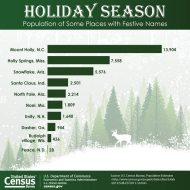 At this time of year, the Department of Commerce’s U.S. Census Bureau presents holiday-related facts and statistics from its data collections, including details about mail, retail sales, toys, trees and decorations and much more. The nation's projected population as we ring in the New Year is estimated to be more than 312 million. 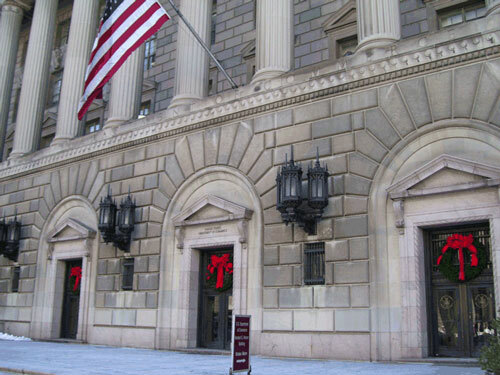 Happy holidays from the U.S. Department of Commerce! 248 million: The number of turkeys expected to be raised in the United States in 2011. That's up 2 percent from the number raised during 2010. The turkeys produced in 2010 together weighed 7.11 billion pounds and were valued at $4.37 billion. 1.1 billion pounds: Total production of pumpkins in the major pumpkin-producing states in 2010. Illinois led the country by producing 427 million pounds of the vined orange gourd. Pumpkin patches in California, New York and Ohio also provided lots of pumpkins: Each state produced at least 100 million pounds. 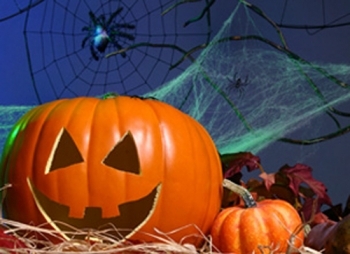 The value of all pumpkins produced by major pumpkin-producing states was $117 million. 13.3 pounds: The quantity of turkey consumed by the typical American in 2009, with no doubt a hearty helping devoured at Thanksgiving time. Per capita sweet potato consumption was 5.3 pounds. 37: Number of places and townships in the United States named Plymouth, as in Plymouth Rock, the landing site of the first Pilgrims.